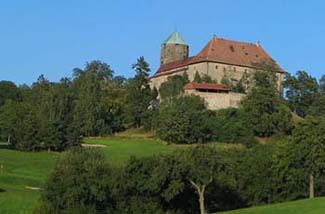 Documentation of Burg Colmberg reaches back to the first millennium. Little is known about the castle until 1318 when the property was sold to Duke Frederic IV of Nuremberg. The castle belonged to the Hohenzollern family for 500 years. By the 19th century, the castle had become the headquarters of the kingdom of Bavaria, and from 1927-1964 the last imperial consul of Japan owned the castle. The Unbehauen family acquired the castle in 1964 and transformed it into a hotel. Many families who travel along the Romantic Road are always asking where there is a reasonably priced castle hotel for an added medieval experience. Burg Colmberg is perfectly located for excursions around the popular town of Rothenburg, and children are more than welcome. For those who have difficulty with stairs, be aware that the castle has no elevator. Colmberg is about 20 km east of Rothenburg. The nearest rail station is Fussen (5 km), but you really need a car to get around the area. Yes. Castle has its own 15th-century chapel and an antique car to whisk you away. The Romantic Road takes the traveler from the Bavarian Alps to the River Main through gentle valleys and peaceful countryside that recalls the medieval and baroque periods of Germany’s history. Along the way is a great castle hotel where you can unpack your bags and spend a few days exploring the region. Burg Colmberg is a solid stone structure built on a hilltop to good advantage for fending off marauding armies. Large beamed rooms warmed by open fires and a stone staircase preserve touches of a medieval age. Bedrooms are modernized, and many have carved wood beds and beamed ceilings.